Manufactured in Allemagne from 1958 until 1960. 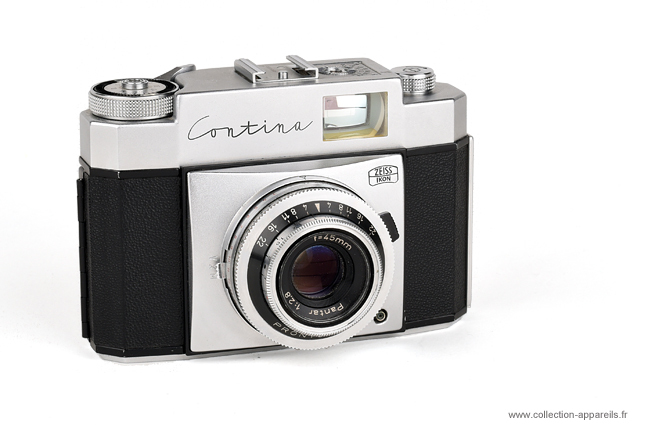 This Contina has a very wide viewfinder, very clearly with lines of centring to avoid the errors which had with the parallax. Several characteristics distinguish it from the other models: the hood is high (to undoubtedly make place with the viewfinder), it is surmounted by a notched wheel. It makes it possible to indicate and to remember the type and the sensitivity of the loaded film. The lever of advance has a very wide axis which is also used as exposure counter.